This calculator will easily convert fractions to decimals and vice versa. To convert proper and improper fractions and mixed numbers to decimals, select "fraction to decimal". 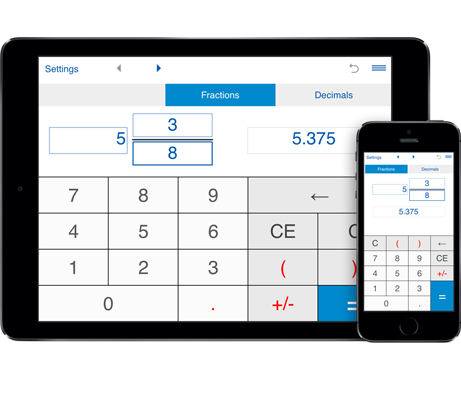 This fraction to decimal calculator converts fractions (proper and improper fractions) and mixed numbers to decimals. Input a fraction or a mixed number, click "=" and the fraction to decimal converter will easily convert a fraction into its decimal form. The fraction you entered will be converted to a decimal. The fraction converter will reduce a fraction and then convert it to a decimal number by dividing the numerator by the denominator. This fraction converter will convert a mixed number to an improper fraction, reduce that fraction if it can be reduced, then perform the division of the numerator by the denominator to find the decimal equivalent of the mixed number. You may enter positive and negative fractions. The input fraction can be a proper or improper fraction, or a mixed number (mixed fraction).